UT students planned and financed the first stadium, and built it in a week. Football stadiums are often in the news. It’s usually about more seating, fancier lighting, hi-tech fields, and larger jumbo-trons – all, as you might expect, at a greater costs. Though it had a more humble beginning, Texas fans should know that UT students – not professional contractors – built the University’s first stadium. And they did it in a week and for just under $800. In the University’s infant years, Longhorn football was played on a 3 ½ acre vacant lot east of the original campus, just off the southeast corner of 24th and Speedway Streets, about where the O’Donnell Building and the Gates-Dell Complex stand today. 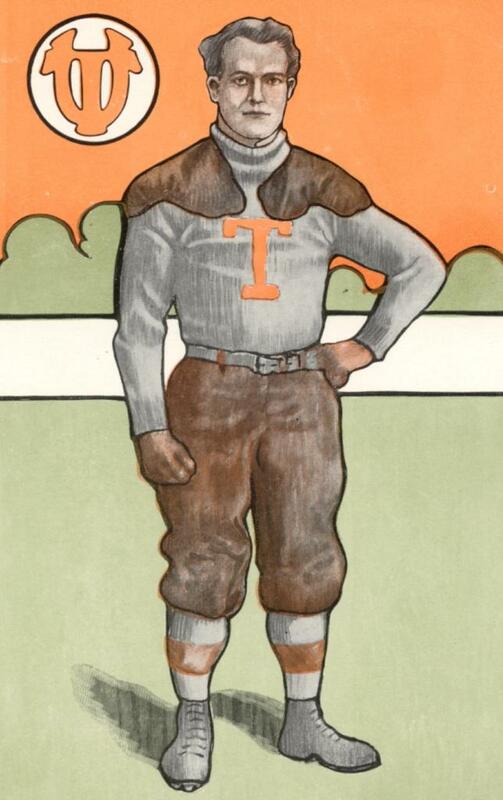 As the campus was too hilly for a proper athletic field, UT students “squatted” on the level plot starting in 1897 and used it for football and baseball games, along with inter-class sports contests. Two years later, the University officially purchased the land, and soon after it was named for the much-loved James Clark, UT’s first librarian, groundskeeper, registrar, bursar, academic counselor, and half-a-dozen other things, who was famous for the Christmas Dinners he gave at his expense to the students who couldn’t make it home for the holiday. Clark Field has since migrated about the campus; its third home is just south of the San Jacinto Residence Hall. 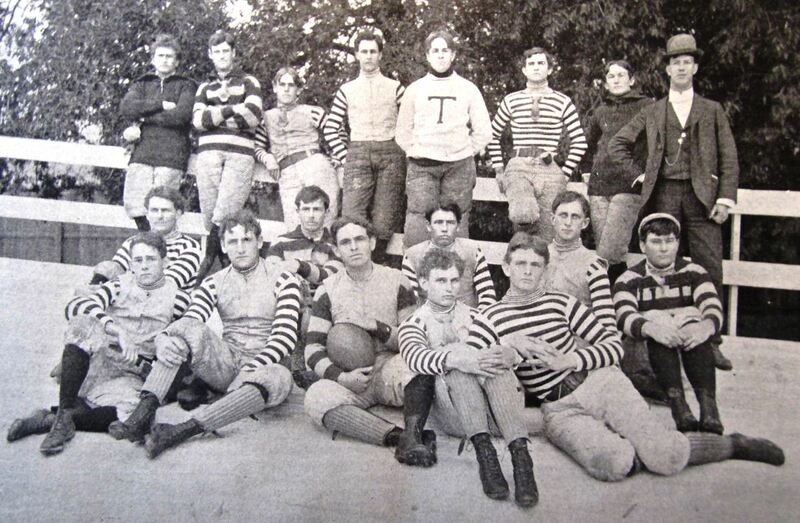 Above: The 1897 UT football squad was the first to use the vacant lot east of campus that would become Clark Field. Initially, UT fans watched the games precariously perched on the 4-inch rail of the wooden fence built to enclose the field. But as University enrollment increased and football and baseball grew in popularity, the uncomfortable rail was abandoned in favor of standing. 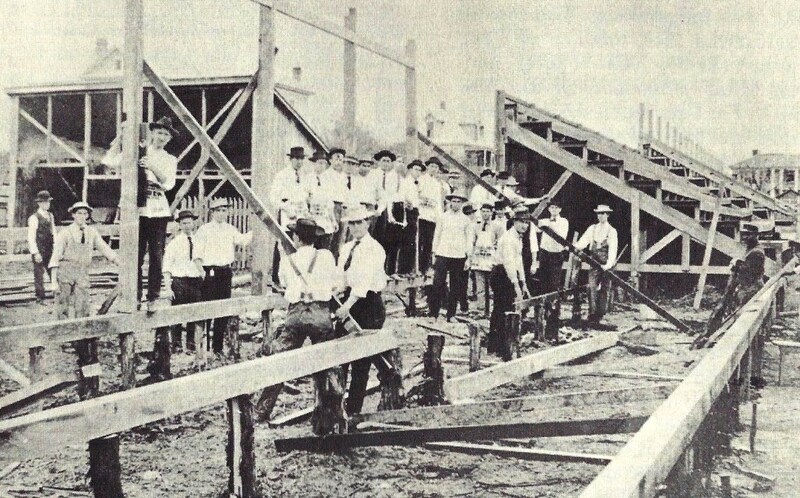 When the field was purchased in 1899, a few small bleachers were hastily constructed along the west side that could accommodate a few hundred spectators, but important games were already attracting several thousand fans, most of whom had to stand four or five persons deep along the sidelines. To make sure onlookers didn’t accidentally intrude onto the playing field, a second fence, made of barbed wire, was erected to keep fans off the gridiron. Those standing in front had the best views, but were in danger of being pushed by the crowd into the wire. The 1907 football season was a great success. The team played eight games, with the first and last against the A&M College of Texas. The opener was scheduled on neutral turf in Dallas as part of the Texas State Fair, but the UT train was delayed five hours because of a wreck on the tracks, and didn’t arrive in Dallas until more than an hour after the scheduled kick-off time. Texas had to hurry to the field, and with no time to warm-up, struggled against the A&M Farmers to a defensive 0 – 0 tie. This left unfinished business to be decided in Austin at the end of the season on Thanksgiving Day. The only other road trip was a two-game visit to the Universities of Arkansas and Missouri. In Fayetteville, the Longhorns literally faced an uphill battle, as one end of the Arkansas field was 15 feet higher than the other. (The challenge of finding a level plot of land for football certainly wasn’t unique to Austin.) At a time when football games were played in two uninterrupted halves, the Texas offense faced downhill the second half and pulled away for a 26 – 6 win. Missouri handed Texas its only defeat of the season, winning 5 – 4, but the trip to Mizzou wasn’t a complete loss. 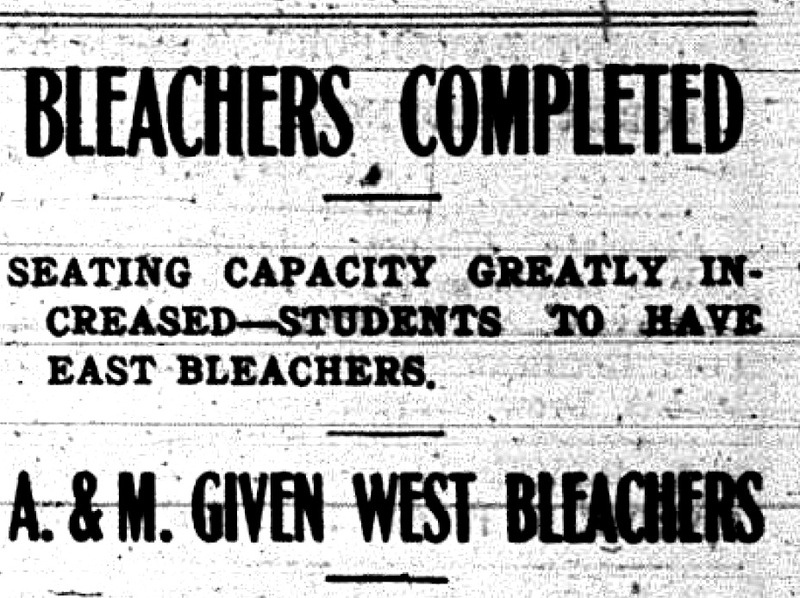 Just before the start of the game, Missouri students held a dedication ceremony for a new section of bleachers they had constructed and financed by selling “bleacher badges” around town. The Longhorn squad and the UT students who accompanied them were inspired by the Missouri students to undertake a rather ambitious project of their own: to increase the meager stands at Clark Field with comfortable seating for several thousand, and to complete it in time for the Thanksgiving Day bout against A&M. Once back in Austin, the University community eagerly embraced the idea, and immediately set about the task of raising funds and drawing plans. The students turned to John Keen, a senior law student who also had construction experience. Keen proposed building 22 movable bleachers that would accommodate 120 persons each. When added to the existing stands, the capacity of Clark Field would be increased substantially to about 3000 seats. In the fall, the stands would be stationed along the east and west sidelines of the football field. Each spring, the east side bleachers would be transported to the north end zone to make room for baseball. 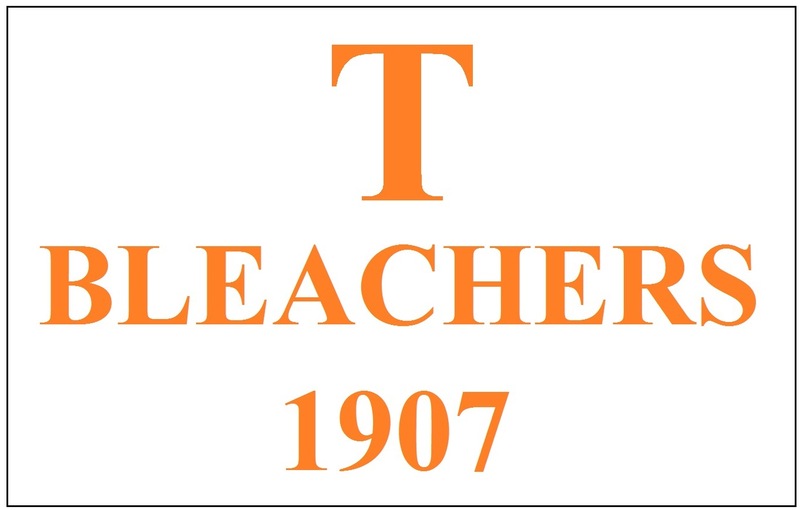 To finance the project, students borrowed an idea from their peers at Missouri and sold white ribbon ”bleacher badges” which bore an orange letter “T” and “Bleachers 1907” underneath. 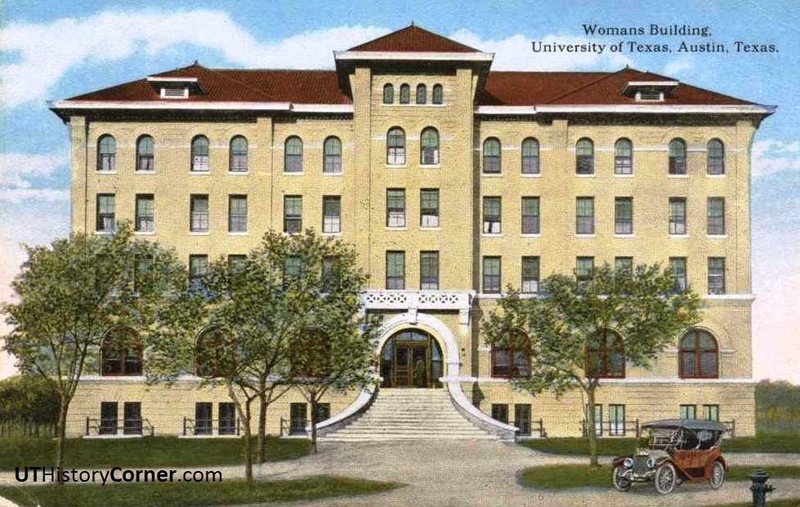 But wanting to do something more, the co-ed students living in the Woman’s Building – UT’s first residence hall for women – created a 3-by-6-foot banner to be auctioned at a University-wide rally. 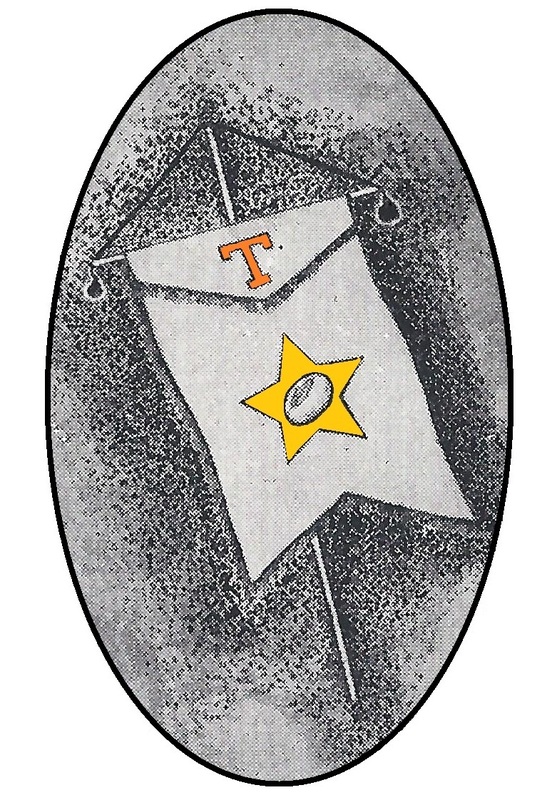 Made of white satin, it featured a bold orange “T” near the top, along with a large gold star, in the middle of which was a Texas football. 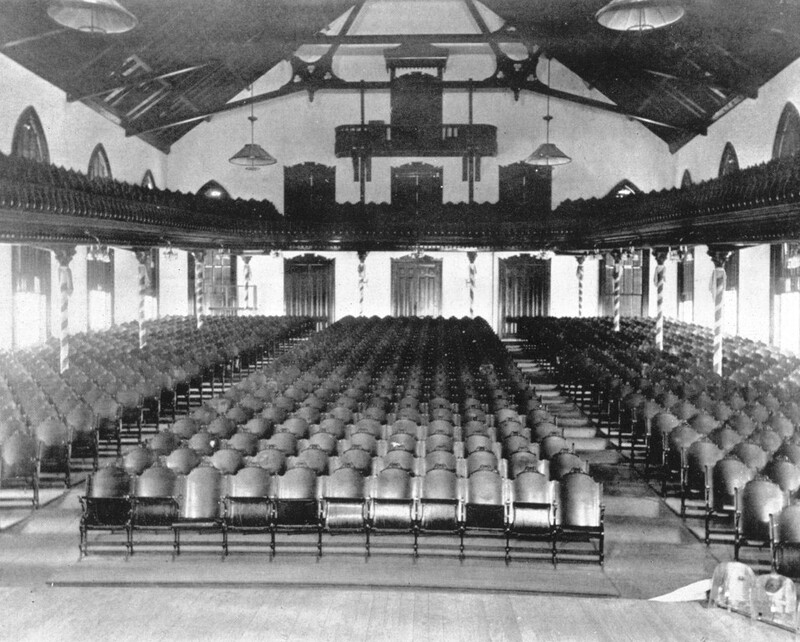 On Friday evening, November 15th, an enthusiastic and boisterous crowd assembled in the auditorium of the old Main Building. The group heard rousing speeches from the football team, engineering Dean Thomas Taylor and Professor Harry Benedict. College yells and songs were in abundance, and when the Woman’s Building residents entered with their banner, everyone stood for an extended ovation. “Texas college spirit … once more greets the Longhorns with the old-time cry of confidence and victory,” boasted The Texan student newspaper. As the auction began, bidding was by department, which at the time consisted of three: Law, Engineering and the Academic Department (Arts and Sciences combined). The Laws opened with a $25 offer that was quickly countered by a $50 bid from the rival Engineers. The auction continued at a rapid pace until the price rose to $300. Interest was intense. Students quickly had to pool their resources to see how much they could afford. The bids continued to rise, albeit more slowly, until the Engineers won with a commitment of $325 to the bleacher fund. When the rally had finished, 662 badges were sold at 50 cents apiece, and the banner auction had garnered $325 for a total of $656. A $132 contribution from the UT Athletic Association covered extra costs, which made the grand total $788, enough for the lumber and other supplies. The following Thursday, November 21st, construction on the bleachers began in earnest, as Thanksgiving was only a week away. John Keen had organized the students into work crews by classes from the three departments, who would take turns in half-day shifts. By faculty consent, students involved in the project were excused from their classes that day. Senior engineers were first Thursday morning, Senior Laws took over in the afternoon, Senior Academic students (“Academs”) arrived Friday morning, and then on to the junior, sophomore and freshman classes. Above: Construction of the bleachers began on Wednesday, November 21st and was completed a week later, in time for the UT vs. A&M football game. Below: Second year law students finished a section of stands and gave it a test run. In the meantime, the A&M football team was also having a winning season, and the “Championship of the Southwest” was to be decided at the Thanksgiving Day game. Local newspapers claimed the Aggies were putting in three practices a day, with signal practice in the morning, full contact play in the afternoon after classes, and weight training in the evening. The bleachers were completed by the following Wednesday, but a heavy rain overnight threatened to ruin all of the students’ plans. Thanksgiving morning, November 28th, Clark Field better resembled an aquatic park. “A great pond stood in the center of the field and another in the south goal, and the corridors were filled with long faces and grave speculations as to what the Farmers would do to us on a sticky field.” The students rallied, recruited volunteers to dig ditches that would drain the water, and then repaired the holes with sand and soil brought in by wheelbarrow. By the 3 o’clock kick-off, the field was in playable condition. An estimated 5,000 fans attended the game, overwhelmed the bleachers and stood along the sidelines. 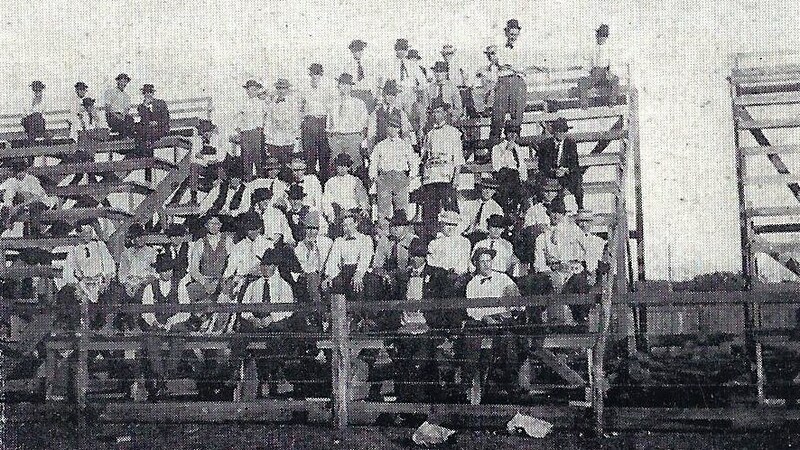 As a show of good sportsmanship, the A&M supporters were given room in the west side bleachers, which were closer to the field’s main entrance along Speedway. UT students elected to fill the east stands, a seating choice that was passed on to the current stadium and continued for more than a century. The game was a fierce defensive battle, but the Longhorns ultimately prevailed 11- 6. Through the next several years, UT students continued to add and renovate Clark Field. The west stands were covered in 1912, a “press box” built on the roof, and north and south seats were added. More than 18,000 fans attended the 1920 Texas vs. A & M football game, at the time a record crowd for the South. 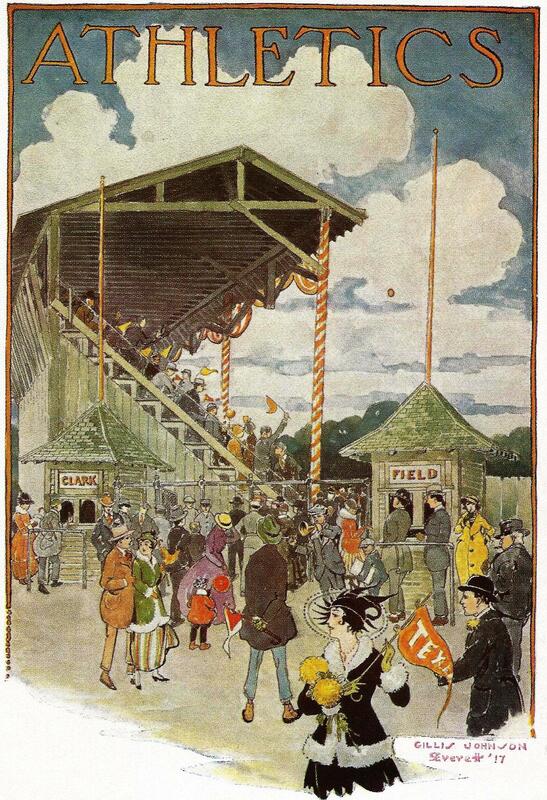 Left: A colorful rendering of the entrance to Clark Field, at 23rd and Speedway Streets, in 1916. The ticket booths and covered grandstands were all constructed by UT students. Click on the image for a larger view. This entry was posted in Uncategorized and tagged Clark Field, Engineers, football, Jim Nicar, Law, stadium by jimnicar. Bookmark the permalink.